Here is a tablet. A Surface Pro 3, to be exact. 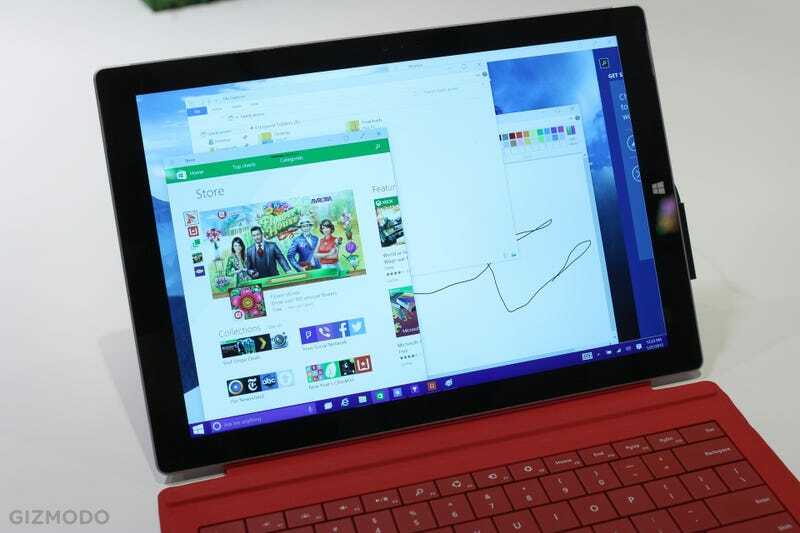 I've never really wanted a Surface Pro 3, but Windows 10 is making me reconsider. Let me show you why. Right now, this Surface Pro 3 has a pretty messy desktop. Those apps are just strewn all over the place. Not terrible if you're using a mouse and keyboard, but could be a major pain with the touchscreen alone. But! Rip the Surface Pro 3 off that keyboard cover, and Continuum kicks in. Up pops a toast notification asking you if you want to switch to tablet mode. Bam! You're immediately looking at a full-screen app instead of a bunch of windows. And all your other open apps are still right there in the taskbar. What's more, all those taskbar buttons get a little bit larger and more finger-friendly too. Swipe in from the left, and those previously opened apps are all there waiting for you. ...and it'll ask you if you want to pin one of your remaining open apps on the right. Easy as that. You can even have "modern" Window Store apps and legacy apps like Paint live side by side. Swipe in from the right for the notifications and setting menus, and you can switch between tablet and desktop modes anytime. But hey, that's weird. No place to adjust the screen brightness. Not even if you press that Display icon or the All Settings menu. Back in desktop mode, I don't need to scroll my mouse cursor way over to the edge of the screen or even remember how to Alt-Tab: There's a handy button for switching between apps. Or, if I've got a compatible trackpad, I can even just swipe up, left, or right with three fingers to swap between programs. Another handy button for notifications if you're using a mouse and keyboard. The Start Screen is nice and big if you want it to be, and defaults to that in tablet mode. But if you want a small Start Menu, it's right here as well. Cortana pulls in all sorts of info I might like without me even asking, much like Google Now. And I can ask Cortana to run a universal search. She's always listening for me to say "Hey, Cortana." She can also send entire dictated emails, but I couldn't try that in this build. Jury's out for now, but I think I'm really going to like Windows 10. It feels thoughtful, like it was made for humans. I have to agree with Kelsey: It might seem like Windows 10 is going back to basics, but it also feels like a huge step forward.